Sometimes all you need is a bit of luck or a forger that can manipulate luck with an enchantment. On The Magicians Season 4 Episode 3 the Brakebills students have their identities back, but there are still problems to be solved — problems that aren’t easy to solve since the students are wanted by The Library. For the most part, it functions as a plot eater, ironing out the relationships between the characters and setting them in the New World Order that is The Library. It’s a dangerous slope to try and move so many plots at once, and while it may work for a few episodes, it can quickly get frustrating. Each of the plots that have been introduced this season seems to move only a fraction, but the writers condense it in such a way that while it’s a lot to process, it doesn’t seem too overwhelming. If anything it’s focusing on the micro-interactions of the characters and building on character history. Let’s start with one of the central plots. 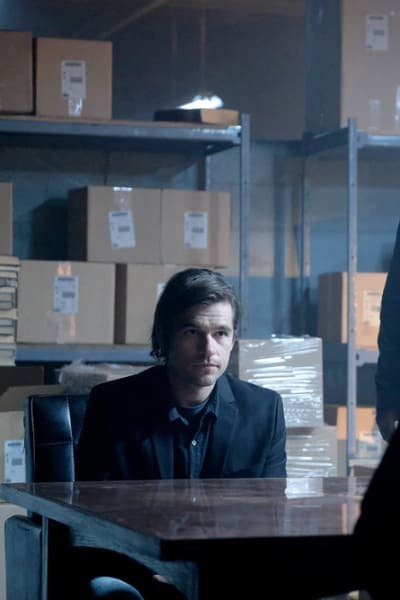 Picking up from where The Magicians Season 4 Episode 2 left off, Eliot (or rather the monster) has found them and is deciding the order in which they should die. Hale Appleman’s performance so far this season has been stellar, it’s showing a different side to his character, and he makes the monster seem so creepy. 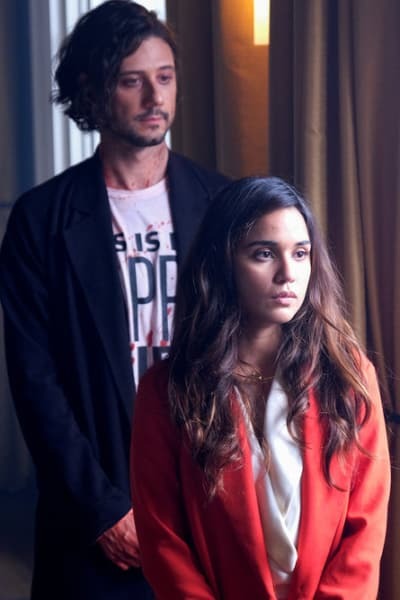 Appleman’s embodiment of this new persona is almost cat-like in comparison to Eliot’s regular self, and it’s entrancing and creepy to watch at the same time, especially when he plays against Summer Bishil. Eliot and Margot’s relationship has always been one of the foundational relationships of the series. Seeing how it has changed really makes me miss Eliot. Bishil and Appleman can convey the awkwardness and fear so well in their lone scene together. Margot’s admission that she loves Eliot is one of the most heartbreaking moments; it’s also the most vulnerable we’ve seen her in a long time. She’s scared for Eliot, and it’s clear that she will do anything to save him. The monsters motives are still in question as well. Just an episode ago their magicians didn’t remember who they were, and now we’re finding out that the monster doesn’t know who they are. The dichotomy there is very interesting, and the monster’s quest for “something” only makes the quest that much more low-key scary. Whatever he is after, it feels like this will be a slow burn reveal, which is something The Magicians has always done very well. Meanwhile, on Earth, the rest of the magicians have figured out that Marina isn’t as altruistic as she seems. Marina plans to turn them over to the McAllisters in return for three magic batteries shaped like coins. To get this done they have to enlist the help of a forger, and this is where The Magicians excels at eating plot. This one plot is the center of the episode, and it’s told in three parts. Frankie, the forger, delivers a lot of the explanation during these parts, but it’s folded into the action. The game of Push could have been an intense and still moment, but instead the intercutting of explanation while playing compresses it. The first part, trying to get a Dewey coin for seed magic, was a terrific insight into the world. Push essentially reads like a magic game of war in which the objective is to cheat by whatever means necessary. Some of the moves the players pull are slightly ridiculous, and while I wanted to see more of it the way that it’s presented feels like just the right amount of time. Stealing The Library’s Black Card to make a copy feels a little more low-key in comparison, but it does give us a good Kady and Penny scene. 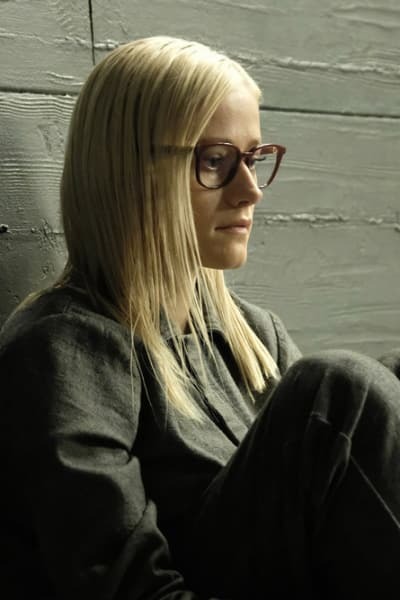 It’s easy to forget that the Penny we see is really Penny from the twenty-third timeline, as seen on The Magicians Season 3 Episode 11. In that timeline, Penny was with Julia not Kady, and Penny’s experiences are much different. The history between them is still on the audience’s mind, but this couple — who has already been through a lot — now has a whole new barrel of fish to sort through. What’s particularly interesting about the plot to forge the Black Card, is the downside to the enchantment. It turns out that luck is zero-sum. Someone has to hold a bear that will channel the bad luck, and whoever is holding it is going to have a really bad day. Julia volunteering for this makes a lot of sense. 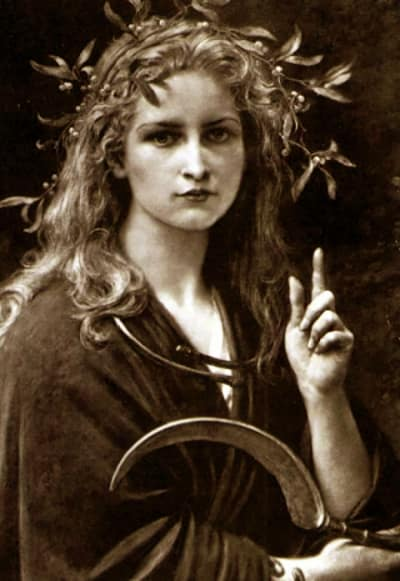 We don’t exactly know how her brief tenure as a goddess is going to affect her storyline this season, but given that whatever is going on with her is powerful enough to mess with the fortune enchantment, we can guess that it’s going to be big. Since Julia can’t hold the bear, that means Quentin has to hold it. Quentin gets a lot of bad luck, honestly, and he did not deserve this at all. View Slideshow: 23 Fantastical Characters and Shows That Need Them!! It is truly heartbreaking though when he gets a call, and he immediately knows it’s about his dad. It’s a cruel twist of fate that Quentin gets this call now, while he’s a bad luck magnet. He knew that his dad’s cancer would come back once magic got turned back on. Quentin spent the last several months pretending to be Brian while his dad was dying, and that has the potential to be devastating. Alice and Santa seem to be a plot that will propel us into the next episode. They’ve broken out of library jail, but Dean Fogg warns Alice that the “Great Blank Spot” has ended and that the books are continuing. That means that if she and Nick are to escape then The Library will know where they are. 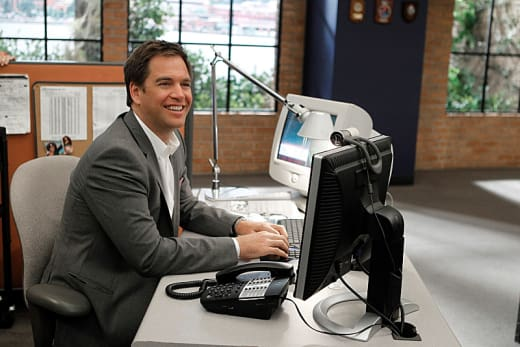 RELATED: 14 Shows You Should Be Watching Right NOW! The trouble is that the books have been taken in for revision, so now Alice has to find the restoration room. It is a plot that doesn’t go anywhere for now, but it gets Alice and Nick out of their cells. As much as I loved their jailhouse friendship, it could only go so far. I’m seriously hoping we see Santa again though. In thinking about where this could lead though, I keep recalling what The Library said to Penny when he first entered. People who read their own books don’t like the ending and hate the main character. If their books are getting revised, what does that mean for their endings? 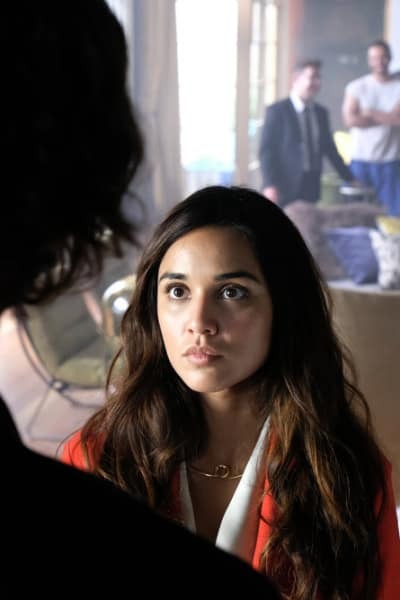 Were you excited by this episode of The Magicians? What are your hopes for what’s next? Do you have any theories about what monster is trapped inside Eliot? And be sure to watch The Magicians online to catch up on all the god-killing, spellwork, and magic you’ve missed so far.